This is a picture of my tent in Accra, Ghana. My tent was utterly fantastic. Many others had tents they had to assemble while mine popped up completely on it’s own! Also, it was quite easy to fold and store once you got the hang of it. I am so pleased with what I paid for my tent and how useful it was to me. I would recommend it to anyone travelling to an area where malaria is endemic. 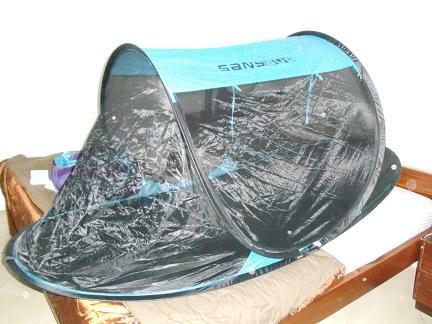 Not only did the SansBug protect me from mosquitoes but it also helped me feel safe to sleep on top of any bed.